Actually the original draft of this post was more or less a personal rant about how bad I was feeling in the past 5 days because of the heat, humidity and pollution. But making some research, I did come out with a very interesting set of data (taken from the HK Government website) that could give you also an idea of what the athletes in Beijing could face. Wednesday 31/7 (5.30am): felt very good, completed a good workout ==> API was actually only 19 because of some changes in the wind pattern. Because Olympic Games are approaching, some post will be covering the topic. so what is the real "Achilles' tendon" ? as far as I knew the way of operating of Chinese Authorities, their real weak points is the non capability to manage appropriately all the crisis and situation where the power of the crowd can go beyond their control. So I can write here a "check list" of what will happen in case of a small or big crisis. Keep it in mind if there will be a chance to use it, because it will give you a told to analyze the situation as it really happened, without the unavoidable deformation of the press. to take a fictitious framework from our sport, I draw the case from this news (very likely, since a direct contact between Japanese and Chinese supporters can easily degenerate). may be some student is drunk or maybe they start to sing offensive slogan, but the Police will not take cue from what is happening to start to "soft" action to defuse the tension. Maybe it could be enough to ask the documents to some guy or going into the groups and speak directly with the people there in a polite manner, but it won't happen. Frontline officers are not trained to decide on their own and usually wants to avoid to meddle into troubles if not asked. Being the situation involving foreigner, it is even more sensitive. So the time pass by and Police at the spot asks for direction at different level of command, while maybe the situation is degenerating: the students start to dispute. because of the time needed to take a decision and being worry of the political repercussion, it will take much longer than needed for the Police to act. In the mean time, a fight broke out among the Students groups. Since the Police is acting very tough, it may become a complete street fights among the 3 groups (Police, Jap Students and locals). this is the most feared moment by the local authorities. phase 6) total degeneration of the situation. Police calls for additional resources and huge mobilization. I hope that the case give you a good vision of what could happen. I really hope the local Police got good direction on tackling immedatly the "weak sign" and avoid the usual PR debacle (only in 2008, they did a complete flop in several local "incidents"). For a starter, read what happened just 2 days ago when the organizer put on sale in Beijing some remaining tickets for the Games, with a poor arrangement and even worse queue management. It could have been a small "glitch", but the poor management by the Police did generate a "disaster"
"the decision on whether the pollution in Beijing is too high to go on with the competitions during Olympics will be taken not by IOC, but by the local organizing committee BOCOG"
Yesterday I was commenting with a local colleague that the weather forecast for the following day was always much milder than the actual temperature reached during the day. Forecast is always with 34C max, while the actual temperature in that moment was well over 36C. Several days in a row like that. for the Olympics.... I can bet the house that the official data will be of "medium to low pollution, thank to the effort of the Government to clean Beijing's skies"
Beijing's air quality fell yesterday as environmental experts, Olympics officials and the mainland media applauded the city for its efforts to clean it up. Beijing's composite Air Pollution Index reached 89, following readings of between 50 and 60 on Sunday, Monday and Tuesday, the first three days of traffic restrictions. According to the index, compiled by the Beijing Municipal Environmental Protection Bureau, all but five remote suburbs in the city had air pollution levels higher than 80 yesterday, with a couple of districts registering up to 99. Any figure recorded above 100 is considered harmful to health. Gilbert Felli, the International Olympic Committee's Olympic Games executive director, was quoted by Xinhua yesterday as saying he had been pleasantly surprised to see the improvement of air quality in the past few days. "I'm very surprised because I thought it would be different but it's much better, much better. You don't feel bad when you breathe, so it looks good," Mr Felli said before the release of yesterday's readings. State media also praised the city's efforts to curb air pollution in the past few days, saying Beijing could keep its promise to offer Olympic athletes clear air during the Games. Xinhua published a chart that showed the capital was expected to have 256 clear days this year, compared with 246 last year, 241 in 2006 and just 100 in 1988. But the official praise was not enough to eradicate doubts that even taking half of the city's vehicles off the roads may not be enough to guarantee better air quality. "Situations like this could happen even during the Olympic Games, but hopefully we will see air quality continue to improve as we probably need at least a week to 10 days to see the effects from this traffic restriction," environment expert Zhu Tong said. Mr Zhu said the rise in the index yesterday may have been caused by unfavourable weather conditions in Beijing. very likely my ideal pace would have been a 3'20"/3'22". This morning I guess that I reached a "breakthrough" in my training progression. For the first time since I got back to training, I felt like I would have been able to run indefinitely. In my very modest opinion, the best "fitness test" is neither a race or a tempo run or whatever. I rather got my best indications of fitness from the value of HR and overall feeling in an easy run. So hitting 17km @4'20" pace with average HR only 147 is very promising sign. NOTE: all this obviously must be inserted in a context where this morning at 6am the temperature was already 29C. At the time of writing the "accuweather real feel" marks a 39C/110F. In the next weeks, I will move to a more intense phase of training, mainly targeting to increase the Lactate Thresold and Aerobic Power + strenght. After 3-4 days of feeling the legs tired and general lack of energy (I guess due to lack of sleep), Sunday I did have good feeling and the workout went very smoothly. wake up 4.30am, at 5am it was already 29C/85%Rh, we set for a mixed pace long run. 30km with 2k easy/1k @MP. It is really a good workout because it helps the body to tolerate the sense of fatigue and depletes the glycogen reserves fast, so the last fast intervals are really a big stimulus. we closed with 27km @4'15" average pace. I felt pretty easy to complete all the intervals, there was still something left in the tank. For reference, I did add some carbohydrates powder to the drinks plus a powergel and it did make the difference in terms of energy levels in the last 30 minutes..
after 2 days of easy runs, it was time to get back to serious, so this morning the alarm clock went out at 4.30am: the plan was a 25k run with 5x1km @ 10k race speed (hence 3'30") for me. The purpose is such workouts is to mix together an endurance stress (for the marathon build-up), together with some good LT workout, without getting exhausted. Being on much lack of sleep in these days, I spent at least 10 minutes in bed asking WHY I was doing this..., rather than just turn the lights off and go on sleeping. Unfortunately I had already took agreement with E. about running together (details: I was in HK this morning), so I was forced to got up and go (the power of peers pressure...). We did 15km easy at around 4'20" (luckily, I was feeling like a zombie), taking a path that could keep out of the Sun. Than is was time to start the intervals and I felt not too brilliant, but still did manage to complete them (for each of them, the pace according to the Polar was 3'31-3'33", but I guess that the actual speed was a bith higher (maybe 3'27" something) because I set the calibration for slower speeds (if you own a Polar Rs800sd, you certainly know that the calibration is affected very much by the speed, so calibrating at 4'15" would result in slightly understated speed/distance if you are running much faster). Weather: week of "nice weather". Give a look at the Accuweather widget on the left side of the blog to understand the "real feel" of 30C/90%Rh. so today was back to racing flats! first my congratulation to fellow italian, friend and reader Stefano who did a fantastic race, establishing a new course record and beating really the best runners around here. Running 33'15" in such heat leaves me at disbelief of his potential (he is also a "fresh" runner). At the unusual start time of 5.30pm, the weather was as good as you can hope in this part of the year: 26C/80F and 95% Humidity (it rained all day, stopped just 1 hour before the race). we started fast .. much faster than any of my expectation ... a first km in 3'20"saw me back in 10th place with already 10/15 seconds gap with the first !! for my current fitness, I really did a good race: I run very steady pace, sticking until 500m from the end to the back of another runner. After the 2nd Km, we set on a 3'30" pace and picked up runners little by little until crawling back to 4th and 5th place. I hate running in the afternoon because I always have digestive problems and today was no exception. luckily 3-4 burps along the way did hel me out of the unconfortable feeling. I was ok with breathing and the general feeling, but the legs were not used anymore to run fast, so I felt a bit like "powerful engine, but can not transfer power to the ground". At the end I closed in 35'02" (5th place), that is astonishingly much better than the 36'40" of 2007 in the same race. This time is also a further demonstration that is not really related how fast you go in training and the race results... in the past months I never trained faster than MP pace, never did any speedwork, but just did solid mileage base. If you have a good base, good racing comes by itself. I forgot to mentin that tomorrow Sunday 13th is race day. After 4 months, I can wear a race bib again. It is a 10k, last year I closed it in 36'40" (with 33C/85%rh) after a month of steady but light training. This year I should be in better shape, but I lack completely of any indication of my current capability in terms of speed and maximal aerobic power. If you put the alarm clock at 4.30am for a long run, got up and found out that is raining hard, what would you do ? Since I would never be able to fall asleep again, I opted for "B". 25km, with 10x1' @10k speed to speed up the legs and gradually get used again to speed work. Sunday, I run with a good friend and we took the chance to push the pace: after a good hour around 4'15"/k pace, we set for 3x3k intervals at 3'50"/3'45" pace. The first one was pretty easy because the sun was still down, but the last 2 were hard, I felt the legs pretty beaten up from the increase in mileage, the 2 long runs and the extreme humidity. For July I am still building up mileage so I can not expect my legs to be anywhere "sharp". The plan is to reach a consistency in mileage and a good base for my long runs, so that in August I could start more demanding and intense workouts to improve the AT and speed. The good think is that I am much ahead in my training progression compared to same time last year, so let's hope that in September the seeds will start to give sign of a good plantation. As I mentioned last week, I found by chance a track in the countryside (incredible, here in Dongguan). On Google Earth, I found out that it may have stretched for several kilometres, coasting several water reservoirs and green areas. So this morning, alarm clock at 4.30 at I went out with the aim to go until the end of the track, a good 30km return. I was not disappointed: it was by far my most interesting run in mainland China in the 9 years of my stay. The forest road went on and on coasting small farms and some tropical tree forest. After 8km, the track become paved, and lead me all the way to Longgang , a district of Shenzhen. - even if mine is a 8 year 2nd-hand stuff, it works smoothly and silently. It is really sturdy stuff. - Lastly, there are many functions for medical and fitness tests (VO2, Conconi, Arstrand) that I am dieing for to try out. And a special word for the Technogym Customer Service. The treadmill came without instruction manual, so I did send a mail to their customer service center, hoping that they could maybe send me at least a scanned sheet of the section relative to servicing and maintenance. Well, the feed-back was beyond my most optimistic imagination. Not only they took care of a request related to a dead old product of which I am a 3rd-hand owner, but they sent me by courier the complete multi-language original instruction manual !! really Kudos to Technogym !! The company really deserves the good reputation built around their brand. I need to find a good balance between making a solid base and do not getting stale for lack of stimuli. So in the next weeks I will introduce some relatively "harder effort" to give some new stimulus to the body and get progressively reacquainted with fatigue. Up to midday today (30 June), the total rainfall recorded at the Hong Kong Observatory in June 2008 has reached 1346.1 millimeters, breaking the previous monthly rainfall record of 1241.1 millimeters set in May 1889 (since records began in 1884). The heavy rain in Hong Kong in June was associated with the active southwesterlies over the south China coastal areas and Typhoon Fengshen. 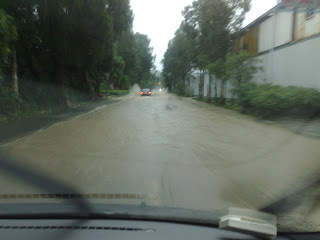 Other areas in the Pearl River Delta were also affected by the heavy rain in June. Up to 29 June, the total rainfall for June 2008 recorded at Guangzhou and Macao have already reached 872.7 millimetres * and 1200.8 millimetres# respectively. These figures also were the highest monthly rainfall records at the two places.